Sales Partnerships delivers Life Sciences results by constantly focusing on improving every element of selling. Our capabilities — the right people, understanding market and demographic data, and vast experience — make us the best collaborative partner for driving lasting results. This has helped us become the gold standard in contract sales organizations. 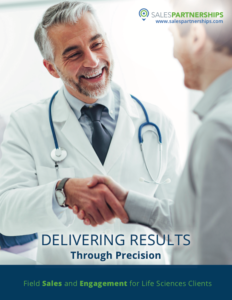 Click here to learn more and download our Life Sciences Contract Sales brochure.